I'm Here. I'm Queer. What the Hell do I read? 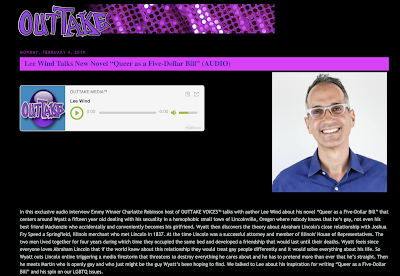 : I'm On OUTTAKE VOICES! I'm really honored to be the guest on this new episode of OUTTAKE VOICES™. Hosted by the very thoughtful (and Emmy-winning) Charlotte Robinson, the podcast series interviews “LGBT leaders & their allies”, focusing on politics and entertainment. I'm in some amazing company, with previous episodes featuring activists like Peter Tatchell, Evangeline Weiss, and Chad Griffin; and actors, singers, and directors like Kyra Sedgwick, Mary Wilson, and Michael Gaucher; and authors of plays and books like Brynn Tannehill and Jewelle Gomez and... me! WOW! My interview covers a lot of ground, and I'm speaking from the heart. Having spent so many years trying to find my voice, now that I have it—well, having this opportunity to be heard means a lot. Listen to the Lee Wind Talks New Novel "Queer as a Five-Dollar Bill" episode here. My thanks to Charlotte for the opportunity, and to you, for being part of my community.